If you don’t already know my story, I have a history of both Binge Eating Disorder (BED) and Bulimia. ‘Binge’ has become a word that’s used fairly loosely now. It’s not uncommon for someone to say that they binged watched a show. So too with food, it’s common for someone to describe any kind of overeating as a binge. 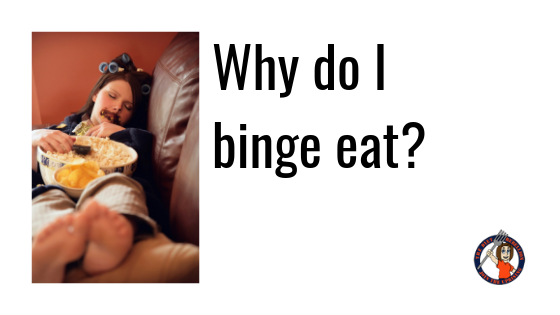 But what is Binge Eating Disorder (BED)? BED is the most common of the eating disorders. It’s currently estimated that 30% of people seeking professional help for overweight or obesity have BED. BED isn’t ‘just’ overeating. It’s eating a large amount of food (although this varies from binge to binge) in a short amount of time WITH feelings of being out of control. Binge eaters often eat very quickly. They don’t have to be hungry to eat and will eat to physical discomfort and may still not stop. Sometimes the binges are driven by emotions – stress, anger, boredom. The eating is a coping mechanism (even if they know that it doesn’t work). The most destructive part of BED is the effects on self-esteem and self-worth. There are tremendous feelings of guilt and shame about the food and the way it was eaten. There’s often a lot of secretive food behaviours while they try to hide the binging. While there’s still much debate around the ultimate cause, we do know that the most common trigger is restrictive eating. For example, one of my patients developed BED after doing a cleanse with her friends. Yes, cleanses are restrictive diets.She was in grade 10 and at the time, she didn’t have any food or body image issues. Not that she loved every part of her body everyday, but she didn’t have an unhealthy relationship with her body. She just wanted to be included with her girls. And cleanses are touted to be healthy right? By the time that I started to work with her she was 5 years into BED and she had MAJOR food and body image issues. Once the restricted diet is over, the binge occurs. Sometimes the binge is the mark of the diet being over. And then the feelings of shame sink in. Self-loathing settles. And then the ‘obvious’ answer is to ‘tighten the reins’. Kitchen clear outs and new plans are often the go-to answer. Maybe it’s to skip a meal the next day to ‘make up for it’ or to practice ‘portion control’. Unfortunately, these restrictions just cycle back into another binge. Is it Primary or Secondary BED? Is there a time of day that my binges happen most often? If you answered ‘yes’ then you likely experience secondary binge eating. This type of binge eating happens secondarily to dietary restriction and responds very well to dietary interventions. Primary BED also responds well to eating interventions but may also need the support of a professional trained in this field. Medication has been found to be helpful with this type and I’ve also seen great results with some natural options as well. BED responds to eating enough food. It responds to the inclusion of more foods, not less.I know that’s scary to think about and I’m not suggesting that you just go out and buy all of your forbidden foods. Intuitive Eating is a researched backed system to help you make peace with food and your body. I’m trained in this system. The principle that we teach before bringing in the forbidden foods is Honour Your Hunger. That means eat! Eat regularly to avoid getting overly hungry. This alone can greatly reduce the number of binges experienced. Eating regularly often requires some planning, especially if you’re prone to skipping meals or just grabbing a quick bite. And yet meal planning can cause a lot of stress. Next week I’m running a free webinar called Mindful Meal Planning Made Easy: 5 Steps to Plan Your Plate. I’d love for you to join me. It’s free and there’s nothing to buy. I will also introduce Intuitive Eating during the webinar.